At Fundrise, our goal is to put our investors in a position to succeed. One of the most effective ways to build a profitable portfolio is through investment diversification. Simply put, diversification is the process of investing in different types of assets, minimizing a portfolio’s overall risk by lessening the impact you’d see from a single asset loss. This is especially true when investing in real estate, where deals may outperform and underperform based off of original projections. Over the past decade, hundreds of large institutional organizations—pension funds, endowments and foundations—have embraced diversification to find higher returns at lower risk levels. More and more, diversification into the real estate market is seen as an important strategy for institutional players to provide current yield and inflation protection. The New York State and Local Retirement System exemplifies this trend. The third-largest pension fund in the U.S. has 6.9% of their assets, over $12 billion, directly invested in real estate. Studies indicate that the risk-return tradeoff of portfolios that include real estate improves versus portfolios that only include standard financial assets. 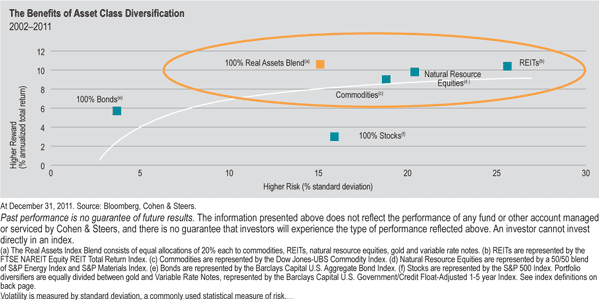 Between 2007 and 2011, pension portfolios including real estate, saw higher returns of more than 1.4 percentage points compared to traditional stock-bond mixes.